The unprecedented boom lead in the tech industry has conceived the rapid evolution of Mobile application. And of course, with the use cases increasing, it has become more of a cake walk. Further, there is an extensive range of tools and frameworks accessible in the market for Mobile Application Development. The Platform and device diversity ruling the mobile landscape, the App Development Companies are flooded with various option. With the easy affordability of Smart Phones, latest application development are great in demand. But here comes the question which is the most reliable and easy to use framework offering various development benefits. Well, frameworks is a software library that offers the platform for app development. In this blog, let's explore the top framework for mobile application development. With PhoneGap, app developers can build app-store ready apps without worrying to maintain native SDKs. Corona - a cross-platform framework allows creating apps and games for mobile devices and desktop systems. That means once you create your project and publish it to multiple types of devices, including Apple iPhone and iPad, Android phones and tablets, Amazon Fire, Mac Desktop, and more. Corona fastens the development process and it also allows to update your code, protect the changes, and spontaneously see the effects in instant-update Simulator. Further, after the app development, build and deploy, code update can be viewed automatically. The apps are automatically compiled at build time, streamlined for performance and stability, as it owes the competency to perform at every core level. This Cross-platform Mobile App Development framework also grants mobile test automation and mobile backend as a service (MBaaS). It also supports crash detection. It is quite beneficial to build high-fidelity apps in no time; and credit owes to LiveDeploy, as it ensures the developer deliver code updates, A/B test, content updates, and space to fix bugs both before and after the app’s development. Furthermore, it allows to drag and drop main Ionic UI components, supplement design files, themes, animations, and customized edits for the codes. 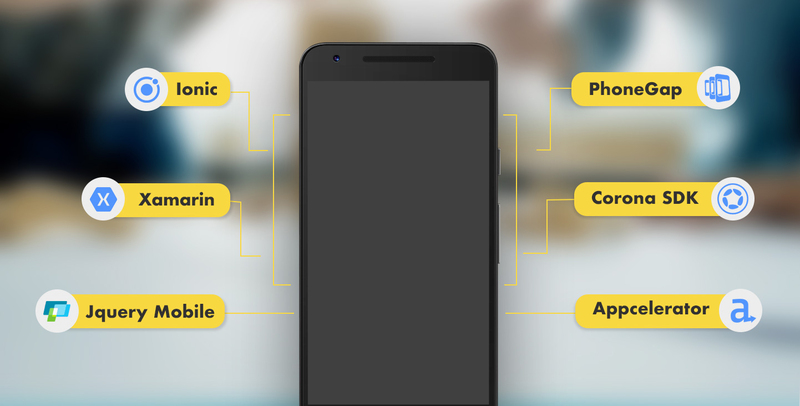 The Android app developer uses this framework as it is best to generate native apps binaries in the cloud with Ionic Package to get from code to the app store with no platform dominions or intricate build steps. Xamarin allows building a native application development for platforms like Android, iOS, and Windows. It works on a shared C# codebase which beauty lies in making the code compatible with all the platforms. Further, for the new OS releases, the window of moving cutting-edge apps is available with the same-day support, and this aides to lessen development time. Using the Xamarin framework the app developers can also test the functionalities of the app, to be implemented in the cloud with regular tracking of the app. Properly composed to build responsive websites and apps - jQuery Mobile is an HTML5-based user interface framework. It allows the apps to run on all platform including smartphone, tablet and desktop devices. Interestingly, this framework supports "write less, do more" tactic. The developers can design a single highly-branded responsive app that can work flawlessly across all the different platforms. jQuery app development framework is designed on the rock-solid jQuery and jQuery UI framework and render Ajax navigation with page transitions, touch events, and numerous widgets. Its lightweight code is generated with continuous enhancement, copulated with the quickly themeable design. The above mentioned are popular and top notch framework beneficial for mobile app developers to build highly interactive and engaging apps to hot more number of user base. Don't hesitate to consult our experienced app developers! Fill in the given below form with your detailed requirement and allow us to assist you to build your dream app into reality.